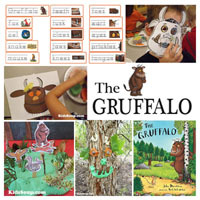 The Gruffalo - Preschool activities and crafts. Do you know the Gruffalo? The Gruffalo is a delightful children's book by writer and playwright Julia Donaldson, illustrated by Axel Scheffler. 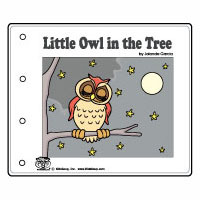 The book tells the story of a mouse taking a walk through the forest and running in to several hungry animals (a fox, an owl, and a snake.) To avoid getting eaten, the cunning mouse invents the Gruffalo, a "terrible creature with terrible claws, and terrible tusks in his terrible jaws." 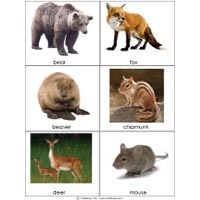 The Gruffalo's favorite food happens to be the animal the mouse is talking to. 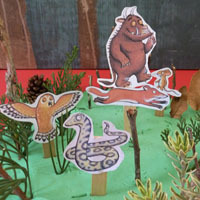 Frightened that the gruffalo might eat them, each animal flees. The mouse scoffs at them, for everyone knows "There's no such thing as a gruffalo!" But--you guessed it--there is a gruffalo, that thinks the mouse will taste good on a slice of bread. Undaunted, the clever mouse devises a plan to frighten the gruffalo off. Begin the day by placing a blank piece of white construction paper and several colors of markers in your large group area. 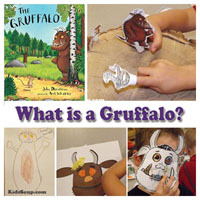 When children gather, ask them, “What is a Gruffalo? What would it look like?” As they describe what they think a Gruffalo would look like and draw it on the paper. When all of their ideas are exhausted, show them The Gruffalo by Julia Donaldson and continue by reading the story. 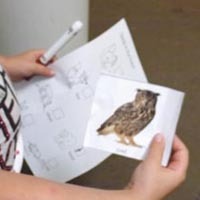 Beth, a preschool teachers, shares a number of exciting and engaging activities you can do with your class centered around this story. 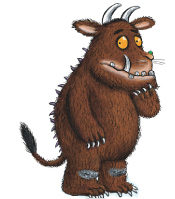 Print a picture of the Gruffalo for each child. 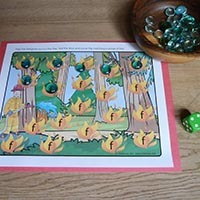 Hand out 12 counters to each child. 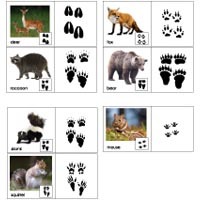 Let children point to the matching body parts on the Gruffalo Mat and place a counter on it. Place the Gruffalo Cards face down on a table. Taking turns, each player turns over two cards. If the cards match, the player gets to keep the cards and gets another turn. If the cards don't match, the cards get turned over again. The player with the most cards wins the game. 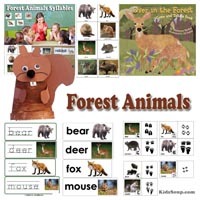 Hand out a forest board to each player. 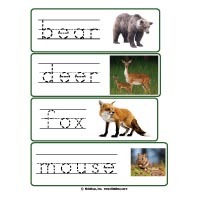 (For younger children that are not able to read yet, glue the matching picture on top of the word.) 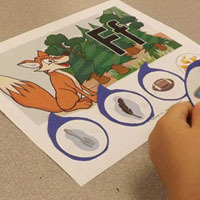 Let children place the pictures on the matching words or pictures. First children create a Gruffalo head with brown play dough. 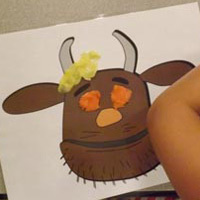 Then, roll the dice and add the matching Gruffalo parts to the head. Let children paint a large styrofoam cup brown. Let dry. 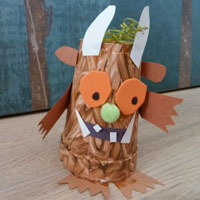 Cut out horns, tusks, a black mouth, teeth, two orange eyes, spikes, arms, and feet out of craft paper. 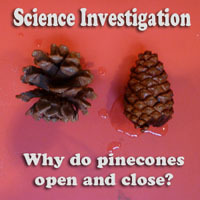 Let children glue the pieces on the cup. 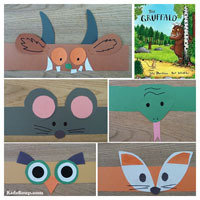 Create headbands for each character of The Gruffalo story. 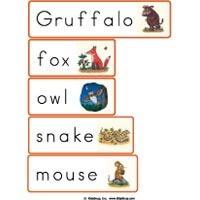 Let children re-tell the Gruffalo story wearing the headbands. 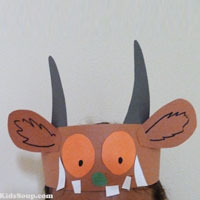 Then, invide children to make a Gruffalo headband to take home. Take children outside to a place with lots of trees. Provide children with some play dough and let them create a Gruffalo Tree creature by sticking play dough on the tree trunk to create face features and adding sticks/leaves, etc,. for horns and teeth. 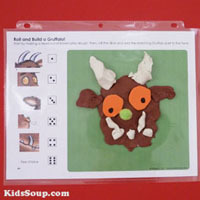 Print The Gruffalo Finger Puppets printables and laminate. 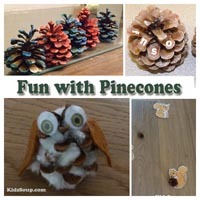 Cut out each character without the finger handles and glue the top of a craft stick. 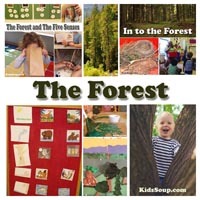 Provide play dough, pine twigs, sticks, pinecones, and stick trees to create their forest scene. 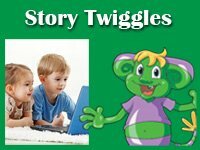 Encourage children to replay or create their own stories. 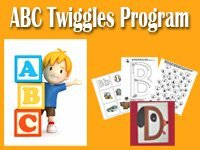 Sign up now and get access to all our over 9,000 preschool and kindergarten resources!